Oscar Watch looks to break down the different categories for the 2014 Academy Awards. We’ll do our best to give you the inside track for your Oscar pools. Above: Jaret Leto as Rayon from Dallas Buyers Club. From it’s debut at TIFF last fall, Jared Leto’s performance as Rayon is the first thing people talk about when they talk about Dallas Buyers Club. His transformative performance even overshadows McConaughey’s at times. Leto gets to play the entire range with his character; when Rayon is his usual self he’s flamboyant and in your face, but also has emotional moments as well when he relapses into his drug use or in the scene where he goes to see his father. It’s a loud and sometimes showy performance, but that’s the kind of thing that gets supporting actors nominated and an eventual win. Barkhad Abdi: If there was anyone that I thought that could slay Jared Leto, it would be the other captain in Captain Phillips—Barkhad Abdi’s Somali pirate captain Muse. A first time actor, Abdi shows no signs of weakness in scenes where he goes toe to toe with Tom Hanks. He truely was in command of those scenes where his crew first comes aboard the Alabama. There’s just something about his eyes, his mannerisms, and his dogged determination that makes his character that much more threatening. Sadly, The Academy rarely likes to give statues to actors without a proven record so Abdi’s nomination could be his prize. Bradley Cooper: Though Cooper is good, he had a much better performance in last year’s Silver Linings Playbook. There were times in the film where when he went overboard, he REALLY went overboard; and not in a good way for me. Having said that, I think the overall strength of American Hustle is really what landed Cooper his nomination. Michael Fassbender: Nobody does bad like Fassbender. His role as a plantation owner in 12 Years a Slave is one of the main reasons why some people have had difficulty with sitting through the film. His demented, and at times sadistic, character is just the type that audiences love to hate. While the performance is good, I just don’t think it’s as high as the one Leto is giving. Jonah Hill: This is Hill’s second nomination, but like Cooper, I think it’s the weaker of the two (his first nominated and better performance being in Moneyball). We know Hill can do comedy, so while his scene stealing shenanigans in The Wolf of Wall Street are fun, they’re just not doing enough to really push him over the top and really show us more of a range. While it’s a solid field, Leto has been the clear frontrunner since the fall. Almost everyone has fallen in love with his character with Leto picking up awards in this category from both the LA & NY film critic circles, a Screen Actor’s Guild award, and a Golden Globe. Only an Oscar would complete the list. What are your thoughts on our predictions? Give us your thoughts on the Best Actor category in the comments. “We made you because we could,” is what David the android is told. Could the same thing be said of us puny humans? The explorers aboard the Prometheus do their best to answer that question. Before watching Prometheus I wasn’t sure what to expect. I mean, I knew it was being done by Ridley Scott, the man that’s given us a bunch great movies over the years–and the man that also started the whole Alien franchise. I also knew that the film was potentially linked to the Alien universe as interviews with Scott had stated this. All this and more had me excited for Prometheus. I’ll start with the easy stuff. The film is simply gorgeous. It’s definitely futuristic sci-fi sterile, but the way everything is crafted, from the ship, to everyone’s suits, to the equipment and displays, everything has that clean looking aesthetic, but it also has an elegant look about it as well. Also, I love the use of wide shots in the film. You always know where things are and get looks at the surrounding environment in the process, but it also gives you a sense of foreboding; whether its the Prometheus itself or any of its human crew being dwarfed by the environment. Charlize Theron as cold blooded Weyland executive Meredith Vickers (inset as the Evil Queen in Snow White and the Huntsman). The film also has great performances by Charlize Theron, Michael Fassbender, and Noomi Rapace. If I were a 2012 summer movie, I’d want to make sure I had Theron in my movie. In both of the roles she’s had this summer (Snow White and the Huntsman and now Prometheus), Theron really brings a great sense of evil to her characters. True the evil corporate honcho thing has been done before, but Theron definitely adds something more sinister and menacing to make this one her own. Noomi Rapace as the “faithful” scientist Elizabeth Shaw. Noomi Rapace on the other hand, I thought gave a pretty solid performance. The girl with the dragon tattoo’s second American feature definitely provided her with more of a canvas to make a name for herself here in the US. Comparisons have been made between her character (Dr. Elizabeth Shaw) and Sigourney Weaver‘s Ellen Ripley, but I don’t think they’re the same type of character. Shaw definitely has more of a softer side than Ripley, and while Shaw holds her own, she definitely wasn’t a reluctant badass that Ripley was. Michael Fassbender as the enigmatic android David. Finally there’s Michael Fassbender turning in a great performance as the android David. I really liked what Scott did with the android character in this film, not making him a straight up bad guy like in Alien, but still not making David too much of a helpful kind of guy. Another departure for the andriod character in this film was that from the beginning we know that David is an android, SPOILER ALERT–something that wasn’t the case in Alien. Everything Fassbender does with David though, from his tone, to his mannerisms, to the sound of his voice all add to the beguiling nature of the character. As a result, you’re not quite sure if his malicious nature is his doing, or from the commands he’s been given. As great as an actor as Fassbender is you might have thought he would have some difficulty playing a robot. Definitely not the case. All of this isn’t to say that Prometheus isn’t without its problems; the most egregious being the number of questions the film leaves unanswered (since this is a spoiler free review, these questions will not be present here). I’m all for leaving things ambiguous so that the audience has something to think about as they leave the theater, but it felt as if the film left too many things unanswered–some of them not even big or philosophical. Is human folly inherent in our DNA? I’m not sure even the movie’s Engineers (seen here) could answer that one for you. Something else that bugged me was the human stupidity on display in the film. Taking place nearly 80 years in the future you would think that us humans would have a little more common sense when journeying to a far away planet. Yet time and again in the film events are set into motion by human stupidity. I wasn’t sure if this was lazy storytelling by the filmmakers or if it was a commentary on us as a species. Finally, mainly in the latter half of the film, one problem I had was that the characters made assumptions about things without really having the evidence to support those assumptions. Isn’t it supposed to be that the audience knows more than the characters do? Yet time and again the characters in the film apparently made lots of educated guesses on what was going on when clearly the evidence at hand (literally what I watched on screen) was ambiguous at best. Again, this kind of circles back to questions not being answered. All in all though, I enjoyed Prometheus, the story it told, the questions it posed, even with its problems and all. One final note, the film leaves things open for a sequel. A sequel I hope that doesn’t happen. Reason being, I think that the things left unsaid in Prometheus will be better than anything the filmmakers might come up with to explain them in a possible sequel. I’m sure you have thoughts on some of the stuff that went on in Prometheus. Weigh in in the comments below. This X-Men Movie is First Class! 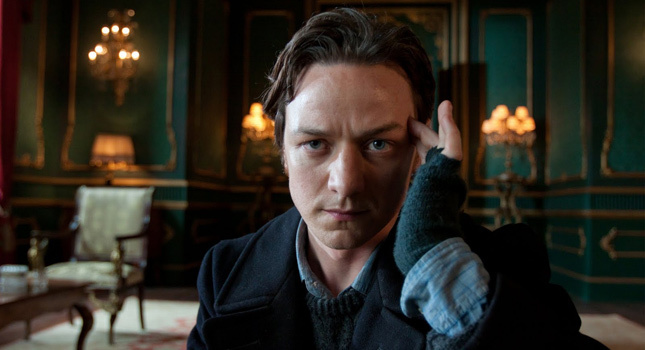 James McAvoy is Professor Charles Xavier . . . the original incepter. THE CHARACTERS: Almost all the characters are portrayed pretty well by the actors. Everyone had be believe that their characters were authentic and I generally felt for each of them when each character faced their own particular hurdle in the film. The two best though definitely anchoring the film had to be . . . THE CHARLES/ERIK RELATIONSHIP: They are arch enemies in the comics, but their history as portrayed in this film I felt was really spot on. They were once friends and we get to see why. Their friendship and relationship felt genuine. However, you could see the train wreck coming the whole time, but you still had to watch and see how they would go their separate ways. McAvoy and Fassbender were great in the two lead roles. AWESOME POWER USE: How the X-Men and mutants in the film used their powers and how those powers were portrayed were really well done. Most of the time power use in the film was for practical application–which was fine because it fit within the story. Sometimes I feel comic book movies overdo power use and make things more than they need to be, especially when CGI and special effects are involved. Thankfully their use of powers was appropriate when necessary and larger than life when necessary. IT FIT WITH X-MEN 1 & 2: This film perfectly lined up with the characters in the first two films which added to the awesomeness of this film–character motivations in future films are apparent in this one. And of course this film fit . . . it was produced by the director of the first two, Bryan Singer. KEVIN BACON: I know, call me crazy, but I liked Kevin Bacon in the villan role. He could have played it SO over the top, but he didn’t. You could have laughed at him because he did Footloose (ok well, you do laugh at that, but then the movie goes on). Again, another good casting choice in my opinion. So yeah, I’m pretty over the moon about this film, and after having said all that did I find anything wrong or bad with it? Well yeah, there are a few things that didn’t quite fit (accuracy of character origins) and some technical issues (not the greatest CGI in some scenes), but for the most part . . . the awesomeness of the film FAR outweighed any negative aspects. Definitely fun, and definitely a great summer movie.